Arrow picks up the pieces from Adrian’s brutal torture of Oliver and addresses his decision to shut the team down as the problem of Adrian still looms over the show. Last week made for a really strong episode and offered a fascinating deconstruction of Oliver as a character. What naturally follows that is a reconstruction which sounds really obvious and cheesy but it’s the next natural step. For the hero of a story the rise has to come after a fall otherwise the villain wins completely and there’s no satisfaction to be had. This episode takes its time in getting Oliver back to the point where he is willing to take action again and lets the audience drink in his sense of despair. It isn’t overplayed in how morbid it is which is good because otherwise it might feel like Oliver was drowning in self pity. Instead he simply seems very detached from everything around him. He sits in his office and goes through the motions but it’s clear that any passion he has is gone. An early scene with Adrian only serves to reinforce this. Adrian is able to walk into his office and give Oliver a free opportunity to kill him knowing full well that he won’t take it. 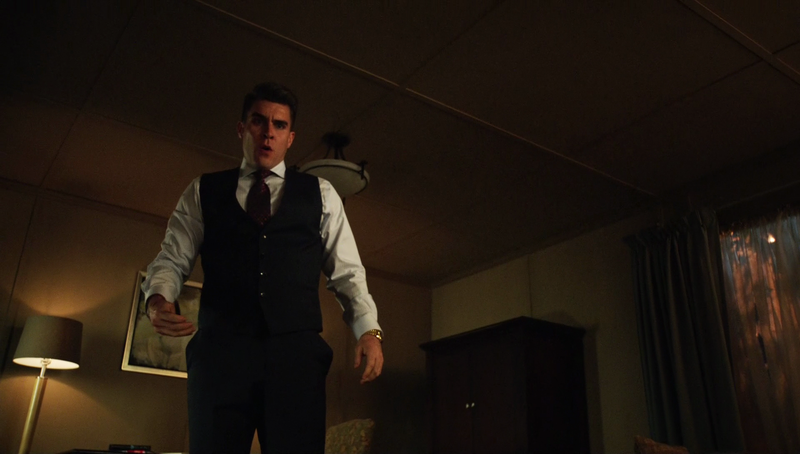 In a sense he feels invincible because as far as he’s concerned Oliver is completely beaten. He has broken Oliver’s spirit so the Green Arrow won’t be a threat to him and the Oliver Queen persona is a shell of his former self so there’s little to worry about there. 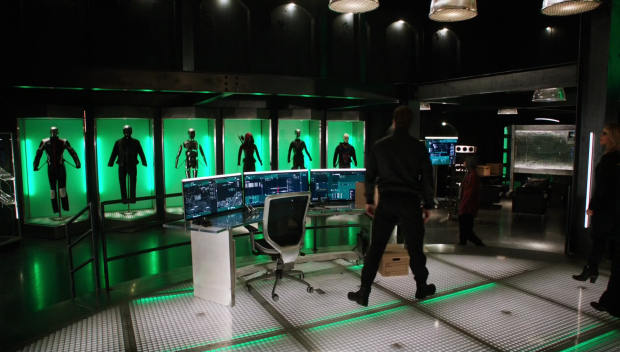 Oliver’s recovery hinges on Diggle and the other people around him. In his mind he is toxic to others and wants to be as far removed from that as possible but Diggle refuses to let that happen. He has a strong sense of who Oliver is and knows that isn’t really an animal who enjoys killing. Oliver tells Diggle that the entire crusade was built on a lie and only existed because Oliver enjoys killing people. There is obviously more to it than that and even if there isn’t it has become so much more than that. At any rate, Diggle doesn’t accept Oliver ending the team because he feels committed to the mission and recognises that there are still people in the city who need to be saved and that the team aren’t just an anti Prometheus squad. It’s important to remember that given the focus on Prometheus recently. Diggle got into this to protect people and wants to keep doing so even if Oliver doesn’t. Oliver’s decision to involve the Bratva in dealing with Adrian is a step too far in Diggle’s eyes. He sees it as having too high a cost and it definitely does when Oliver has to agree to let them steal diabetes medication to make a new street drug that can rival heroin in order to secure Anatoly’s position. It’s essentially a deal with the Devil and it’s something that Oliver is initially willing to live with because he feels that his soul isn’t worth much considering his recent realisation. If Oliver allows them to steal the drugs then that directly contrasts one of the major things he has been fighting for as Mayor. Kord Industries are a small business who are barely hanging on and the loss of these drugs could be potentially crippling for them. Not to mention the medication being needed by many people who are suffering. Allowing this might be something that Oliver could never come back from as it betrays everything that Diggle thinks the stands for. Diggle’s decision to put the team between Adrian, the Bratva and the drugs highlights his desire to keep Oliver from making mistakes he couldn’t recover from and shows his dedication to those close to him. I mentioned last week that Diggle, Felicity and the rest of the team make Oliver a better man and prevented him from travelling down a darker path than he did. Diggle’s entire argument focuses on this. It can’t be disputed that nobody knows Oliver better than Diggle does. They have been brothers in arms for nearly 5 years and have been through so much that a brotherly bond is something that has naturally formed. Oliver trusts Diggle with everything and the reverse is true so Diggle refuses to accept that Oliver is a cold blooded killer because he knows him better than that. The example used is when Diggle killed Andy. This caused him to descend into being self defeating with a willingness to rot in prison but it took Oliver to convince him that he could atone for his mistakes and was better off doing good than rotting away. 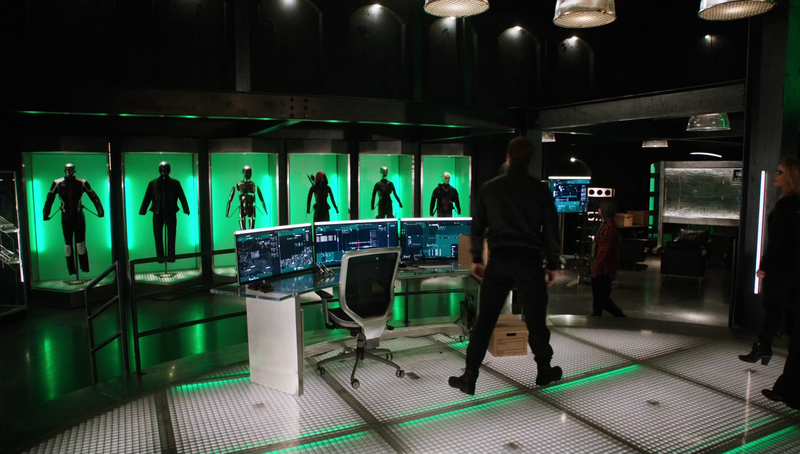 It’s a similar sort of thing here and Diggle uses this to confirm to Oliver that his actions in bringing Diggle back from the bring were the actions of a good man who cares about others. This turns out to be enough to bring Oliver some of the way back but it’s interesting that he refuses to wear the Green Arrow costume because he isn’t ready for that yet. This is fair enough and creates an opportunity for Oliver’s arc to come to a satisfying end when he feels worthy of that identity again. I was really impressed with the acting in this episode from both Stephen Amell and David Ramsey who both brought their A-Game. Diggle’s sincere declaration that Oliver won’t ever get rid of him after all they’ve been through was really moving and says a lot about the relationship between the two of them. We must be able to hack our way out of this one! This episode makes the team feel like a true ensemble that are important to the show. Oliver is still the lead but the team dynamic has been building over the course of the season and their importance is affirmed by this episode when Oliver brings them back together and rededicates himself to the mission. Giving them all mannequins shows how serious he is about keeping them around and solidifies them as allies he is proud to call his team. What could have been is a theme that runs through the flashbacks as well as the present day. Oliver being a better man because of the influence of people like Diggle is made clear and the flashbacks give us the opposite for Anatoly. It’s a little on the nose but he directly says that he’s worried about the sort of man he will become without Oliver around. This could be easily figured out through the exploration of the situation rather than saying it out loud. His appearance in the present day instantly shows us what Anatoly becomes without Oliver to help make him better. Anatoly succumbs to the same corruption that he once fought against and it’s a really interesting parable about how people need guidance in order to become the best versions of themselves. If Oliver hadn’t left then Anatoly might not be a disillusioned leader who needs to facilitate the misery of others in order to hold onto his power. David Nykl delivers an excellent performance throughout that shows how different Anatoly is in both time periods. In the flashbacks he is more optimistic and compassionate where in the present he seems so cold and unforgiving. The five years have been tough on Anatoly and he has been corrupted by the system that he wanted to change. His discussions with Oliver about identity show how he has changed in less than positive ways. He told Oliver that wearing a hood and assigning his darkness to that aspect of his life wouldn’t work which is something that Oliver agrees with at the time. The entire point of this episode is to show Oliver and the audience how wrong that is. The Green Arrow identity has evolved to the point that it represents the best of Oliver rather than the worst of him. Anatoly is under the misguided assumption that he knows exactly who he is and is happy as a result. He says the words but seems anything but happy. There’s almost a desperation to him and the shift in the relationship between him and Oliver to something adversarial only expands on how much has changed. 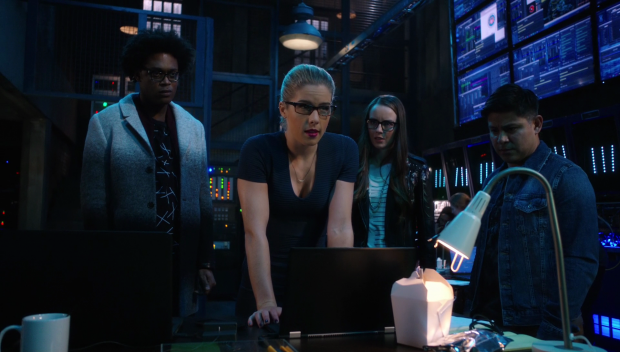 Felicity’s dealings with Helix become very useful this week without expanding too much on her personal corruption. There is a sense that she is starting to prioritise them over Team Arrow but her loyalty to the team isn’t in question. With the help of Helix and Curtis she is able to unscramble an unmasked image of Adrian which she very quickly makes public. It’s really satisfying to see Adrian outwitted for a change as it shows that he can be beaten. His plan is still carefully constructed but he didn’t account for Felicity’s skills nor her partnership with Helix so that failing proves to be costly for him. Of course he doesn’t seem phased by it as seen by him casually dealing with the authorities and driving off whistling a jaunty tune. It’s unclear how he’ll factor into the rest of the season now that he’s a wanted man but I’m interested to find out how that will play out when the show returns in a few weeks time. Another excellent episode that deals with the recovery of Oliver Queen after his vicious treatment at the hands of Adrian. Diggle proves to be the key to his recovery because he refuses to give up and is able to evidence that Oliver is a good man. 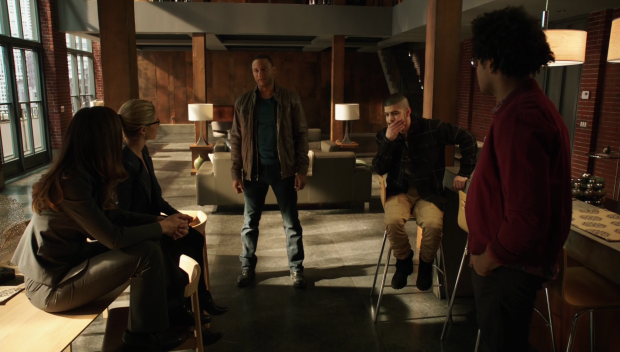 His decision to involve the Bratva in bringing down Adrian is definitely a step too far but Diggle accounts for this by putting the team between Adrian, the Bratva and the drugs Oliver has authorised them to steal. 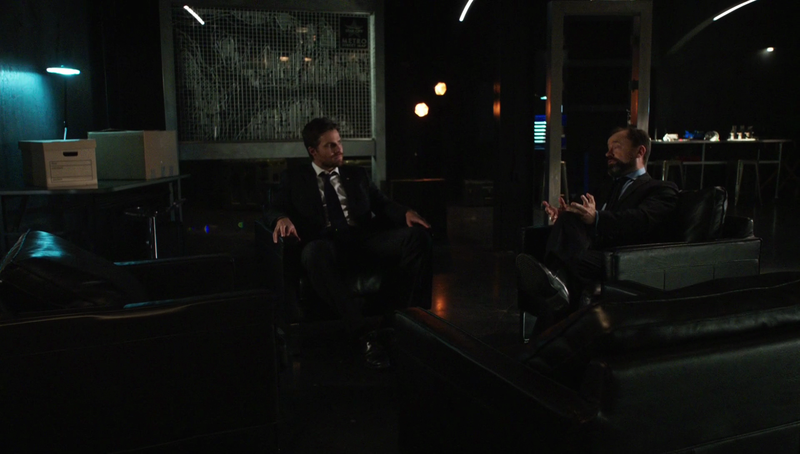 He won’t let Oliver make that kind of mistake and is willing to prove that he isn’t alone. This pays off when he reaffirms his commitment to the mission and supplies the team with mannequins to indicate permanence. Oliver’s relationship with Anatoly and how this connects to the idea of being made better through proximity to others is handled really well. Anatoly is a good case study for that as he appears to have succumbed to the corruption brought on my his position without anyone to stop him from going too far. David Nykl perfectly plays the distinction between both versions of Anatoly and the representation of the changing relationship between him and Oliver is wonderfully handled. Felicity working with Helix isn’t developed much more but they do prove useful in getting Adrian to a situation where he is a wanted man. We have a long break until the next episode but I’m fascinated to see how that will change things for him.